Low prices. OrangeSmile.com offers car hire service in Austria on the lowest-rate-guarantee basis, since we work with car suppliers directly. For your search criteria in Austria, we always select and show the best rental offers. The car reservation process consists of 3 simple steps: (1) search for available cars for your dates in Austria; (2) select your car type; and (3) fill in the booking forms. Once the reservation is completed, you will receive a confirmation voucher to your email address. During the booking process, please check your rental conditions. To pick up your car at the rental point in Austria, you need to provide our confirmation voucher, your driving license and a valid credit card. The final payment is normally carried out at the pick-up point. Our car hire points in Austria accept VISA, MasterCard, etc - please check your rental conditions. At the pick-up point, please read the handling manual and check the car for present defects. OrangeSmile.com wishes you a pleasant journey to Austria! The car hire reservation system OrangeSmile.com allows renting a vehicle in Austria within 10 minutes. Our largest database of car suppliers enables us to provide you a rental car in Austria at the cheapest rate ever possible. At rental locations in Austria we offer the following car sizes: mini, compact, economy, standard, premium and luxury. The following car types are available in Austria: Sedan, Hatchback, Jeep, Cabriolet, Coupe, Minivan and Minibus. Austria is famous for its excellent ski resorts, picturesque nature and numerous historic landmarks. Vienna is the most interesting city from the cultural point of view. During many centuries St. Stephen’s Cathedral has been considered the symbol of the city. 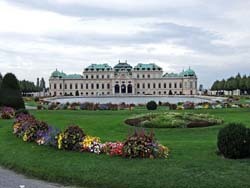 Vienna is an old city and numerous historic buildings and places are treated with great care here, so in Vienna you will find many beautiful churches and castles, such as St. Ruprecht’s Church, Vatican Church, Schoenbrunn Castle, Belveder Castle, St. Bernard Chapel, Parliament House and Town hall. Just like most capitals, Vienna is home to numerous museums – Historic Museum, several Art Museums, Graphics Museum and Albertine Gallery. The former imperial residence Hofburg is worth close attention. The building of the residence took place in the 13th century. The treasury that is located in Hofburg stores many rare artifacts that once belonged to the Order of Golden Fleece. The Crown of the Holy Roman Empire is, without a doubt, the most famous and precious exhibit of the museum complex. The crown was made yet in 962 A.D.
Vienna suburbs are also rich in landmarks. The most popular excursions here include a visit to Durnstein Castle and ancient monasteries. The internationally famous Vienna Forest is located approximately 70 kilometers away from the city. This is a big and beautiful nature reserve that will please all tourists who enjoy walking. Salzburg is another popular tourist city. The most famous landmark here is the cathedral that dates back to the 8th century. The sanctuary is surrounded by three large squares that are also the location of such famous places as house of Mozart, Baroque Museum, Hellbrunn Palace and several beautiful fountains. There is a small village of Tennenhebirge located near the city. This village is famous for Eisriesenwelt Caves. The caves are spectacular, their beauty is so striking that they are also called “The World of Ice Giants”. Every year a small town of Innsbruck attracts many visitors who come to see Ambras Castle that was built in the 16th century. Tourists, who enjoy long walks in beautiful places, are recommended to visit Kitzbuhel. Other popular tourist destinations include sport resorts of Karnische, Arlberg, and Baden. They feature modern infrastructure, quality ski slopes, luxury hotels and rich choice of entertainment centers. Baden is more famous for its balneology complexes, there are several dozen hot water springs there. This is one of the oldest and most famous health centers in Europe that has been popular for over a century. When returning your car, prior to signing all the documents make sure that the rental payment is computed as indicated in the voucher.